When a camera or subject is moving, the resulting blur is in one direction and easy to correct. However, when both are in motion, as with cell phone video taken during a crime or event, then the motion distortion becomes more complex and the video appears hopelessly fuzzy. Our lab created special motion deblur tools to recover those seemingly lost details. When combined with our exclusive focus correction filters, we can recover amazing clarity. Read more. Mouse over, or click, the image below to see what our lab's video deblur tools can do for you. Light originates and reflects from objects in very predictable ways. As the camera and object move, they distort the captured image. These distortions can be reversed using a filter that acts like mathematical eye glasses. 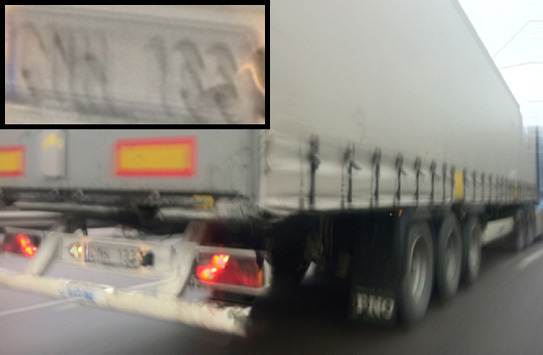 For this example, we used the bent light streak seen at the far right of the license plate. The process could have just as easily been applied to the mud flaps or tires. Read more.